The election of 1870 was very contentious with the rail road support provided by Smith being a major subject. Smith ran for reelection, but was narrowly defeated by Robert Burns Lindsay. After the election, Governor Smith, as well as Treasurer Bingham, refused to accept the result, claiming fraud in the election, and “barricading” themselves in their officies.7 Actually, Governor Smith was well aware of Lindsay’s intent to investigate the methods and level of support granted to the Alabama and Chattanooga Rail Road and he, and his co-conspirators, were intentionally trying to delay any investigation. After a three-week delay in his inauguration, Governor Lindsay took the oath of office and shortly thereafter began his investigation into the State’s support of rail roads, especially the Alabama and Chattanooga. Regarding any records of bond issues, he reported to the legislature that he could not find a “scratch of a pen,” apparently because no records were kept or they had been destroyed or were removed from the capital!8 When ask to testify before the House Investigating Committee, Arthur Bingham, the treasurer who countersigned these bonds, claimed the “constitutional privilege of refusing on the grounds that his testimony would tend to incriminate himself.”9 At about the same time (January, 1871), the Alabama and Chattanooga Rail Road defaulted on their payment of interest on the bonds. Apparently, the lack of sufficient cash to pay this interest was the result of the Alabama and Chattanooga redirecting a large portion of the state bonds to build an opera house and luxury hotel, called “Stanton House”, in Chattanooga, Tennessee. 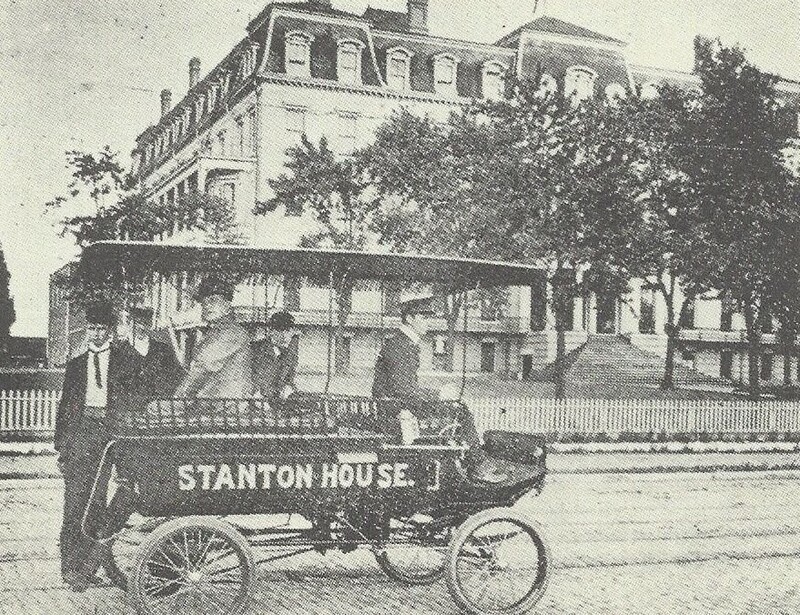 The 5-story “Stanton House” hotel contained 100 guest rooms with restroom facilities on each floor, a first for a multi-story hotel.10 The hotel also contained a public telegraph office and boasted a “horseless carriage for the use of guests”. Room rates were $2.50 to $3 a night and the hotel helped Stanton establish “Stanton Town”, a vibrant business center with multiple shops. The hotel was a very popular stopping place for wealthy travelers on the railroad. 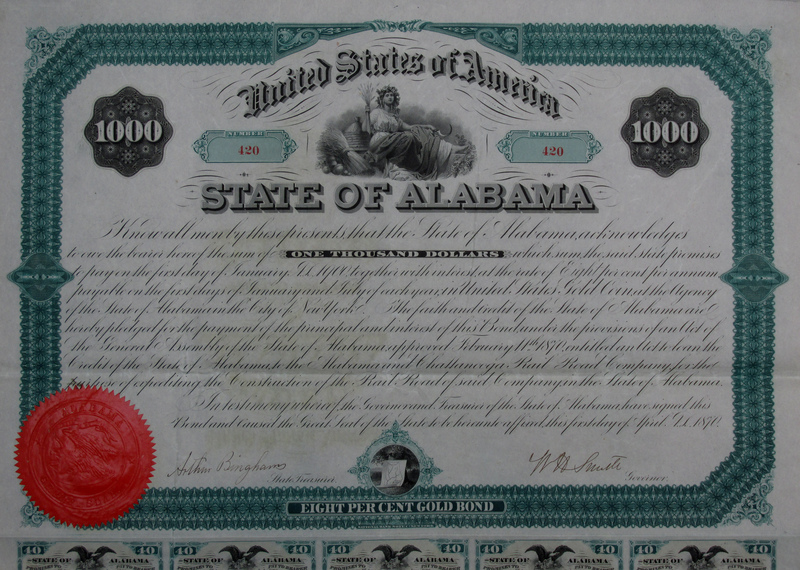 In a lengthy report issued one year later on January 24, 1876, the Commission recommended a number of steps including refinancing many of the legally endorsed bonds at a lower rate of interest, disavowing some bonds as improperly issued, and in the case of the $2,000,000 in direct support to the Alabama and Chattanooga Rail Road, swapping the State’s mortgage bonds on the Alabama and Chattanooga land for these direct bonds issued by the state.17 Holders of the direct bonds were provided with bonds of equal stated value which were the state’s security against default by the Alabama and Chattanooga Rail Road. Given the opportunity to swap bonds with dubious value for bonds secured by the rail road’s land and rights-of-way seems like it would be a welcome opportunity, provided the holders were aware of the situation. When submitted the State, the direct bonds and their coupons would be destroyed. We know the state made every effort to inform bond holders of the offer, and one would suspect that individuals who had not received interest payments for a number of years would have made independent inquiries even if they had not seen any of the newspaper advertisements. How then can we explain the survival of uncancelled bonds with attached coupons.? First, while these bonds found their way to Europe and England, many of them remained in the hands of agents, and were used as collateral (“hypothecated”) for other loans. Hypothecated bonds were pledged, but not released to the lender, and these loans were repaid the bonds remained with the agents, perhaps after the deadline for redemption. A second possibility, and a less likely explanation, is that these bonds were “saved” from destruction by government employees or their agents to serve as souvenirs. Whatever the reason, these bonds remind us of some very difficult financial times in Alabama following the end of the Civil War. 1Walter L. Fleming, Civil War and Reconstruction in Alabama (New York: The Columbia University Press, 1905), p.592. 2John W. DuBose, ed. by James K. Greer, Alabama’s Tragic Decade: Ten Years of Alabama -1865-1874 (Birmingham: Webb Book Company, 1940), p.178. 3Samuel L. Webb and Margaret E. Ambrester, Alabama Governors: A Political History of the State (Tuscaloosa: The University of Alabama Press, 2001), p. 89. 7Webb and Ambrester, p. 89. 11Gary C. Jenkins, “John C. Stanton,” http://tennesseeencyclopedia.net/entry.php?rec=1257. 12James A. Ward, ed. Southern Railroad Man. N. J. Bell’s Recollections of the Civil War Era. (DeKalb: Norther Illinois University Press, 1994), p. 143. 16Report of the Commissioners (Debt Commission), January 24, 1876, State of Alabama Senate Journal, 1875-1876, p. 205. 17Report of the Commissioners (Debt Commission), pp. 228-229. 18Report of the Commissioners (Debt Commission), p. 232. 19 Gary C. Jenkins, “John C. Stanton,” www.Tennesseeencyclopedia.net/entry.php?rec-1257.